First thing I did when Yo La Tengo announced their new album was to give the ‘murdering record’ another spin. I’m pretty sure that some purists will hate me at some level for doing so. But the fact remains, I did it. Carefully and humorously slaughtering about thirty classic pop and rock songs is just something I dig. Of course it goes without saying that Murdering the Classics (2006) is not representative for their impressive discography. For quite some time now Yo La Tengo are unanimously accepted to by leading in the indie rock scene. It was the couple Ira Kaplan and Georgia Hubley who formed the band in mid-ninety eighties naming it after a baseball related anecdote. 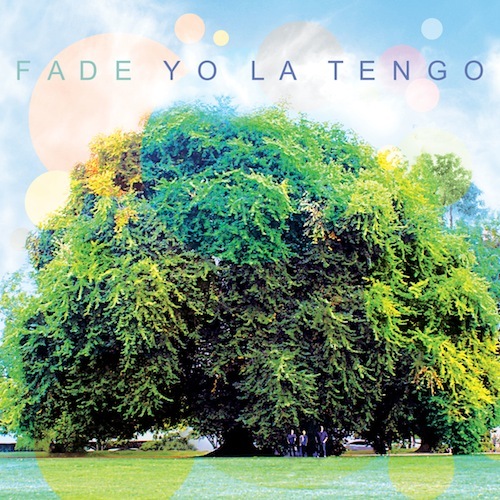 Since then Yo La Tengo consequently released various highly acclaimed albums. I Can Hear the Heart Beating as one (1997), And Then Nothing Turned Itself Inside-Out (2000) and Summer Sun (2003) are probably the best known records coming from Hoboken (USA). Their last record with the generic title, Popular Songs (2009) was met with mixed reactions by the critics. This January their new album, Fade was released. The length of several songs on Fade already gives a brief idea of what you can expect. Indeed, refined and tranquil sound that will make you forget time. While placidity flavors Fade, the opening track Ohm appears to be the most energetic song. However the hypnotizing guitar arrangements and polyphonic singing restrains the song to break free and keeps the listener in a steady flow of numbness. The string quartet on Is that Enough replaces the numb feeling with some romanticism which is followed up by Well You Better, a track that makes me think of another great indie band, Belle and Sebastian. After this Yo La Tengo make clear that they can still surprise the unaware listener. Yet again the band members change their style. Hubley prominently joins her husband on Paddle Forward and flirts with the indie style of approximately fifteen year ago. Also be sure to skip to the gorgeous snare snapping track I’ll be around if you’re in a dreamy mood and only want to watch the clouds to float by. From this moment on Fade can become somehow repetitive. Nonetheless if you give it some time you will hear exquisiteness of the band with calmness of Cornelia and Jane and The Point of it. With this new album Yo La Tengo returns to their sound of the late nineties. Fade doesn’t excel when it comes to innovativeness. This is however hardly a problem, the fine mix of subtle and delicate songs will certainly be appreciated by long time followers making it a mandatory buy. For people who are new to the band Fade is an ideal introduction but also can test your span of attention. Once more Yo La Tengo delivers an utterly beautiful and timeless album. Thus proving that they belong to the top of their class and beyond. This entry was posted in WRM and tagged Belle and Sebastian, Fade, Georgia Hubley, Hoboken, Indie rock, Ira Kaplan, Matador Records, Music, Yo La Tengo. Bookmark the permalink.